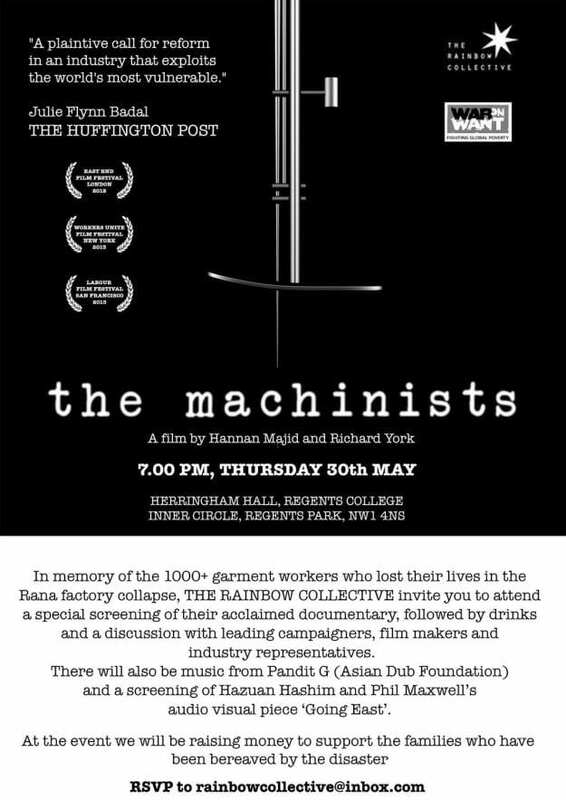 This week social enterprise production company The Rainbow Collective screened ‘The Machinists‘ (2010), a documentary by Hannan Majid and Richard York. The screening was in response to a series of recent tragedies in Bangladesh garment factories including fatal fires and the Rana factory collapse. These events collectively killed over 1,000 people and have prompted action throughout the world. The documentary follows the Bangladesh National Garment Worker’s Federation and the stories of 3 very different garment factory workers, showing the detrimental effects of poor working and living conditions on the thousands of people in the garment industry, accounting for roughly 80% of Bangladesh’s exports. The already worrying statistics in the documentary have significantly worsened since the recent Rana factory collapse and factory fires in late 2012, bringing garment worker deaths in Bangladesh closer to 1,500 than the 200 stated in 2010. The Rainbow Collective therefore invites you to attend a special fundraising screening of their acclaimed documentary, followed by discussion with leading campaigners, film makers, and industry representatives. The event will be raising money to support the families bereaved by the Rana factory collapse disaster.